The creation of Basic Units of Cooperative Production (Unidades Básicas de Producción Cooperativa or UBPCs) from the former State farms in 1993 and the opening of Agricultural Markets (Mercados Agropecuarios or MAs) in 1994 were significant steps in a process of reform and transformation for the agricultural sector in Cuba. Some analysts argue that, as a result of the failure of the government to continue its process of economic liberalization, the transition for the Cuban economy in general and for agriculture in particular can be characterized as a dismal failure. 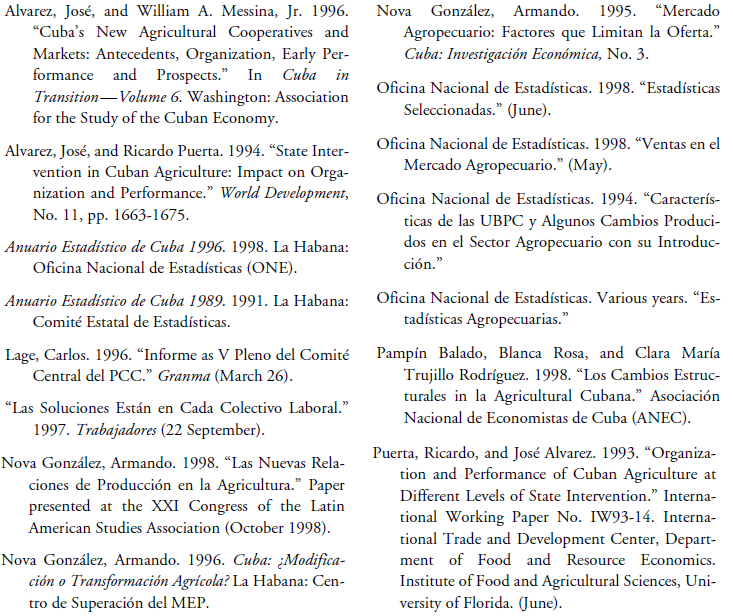 This paper reviews the most current available data in an effort to characterize the present situation in the agricultural sector in Cuba and to assess the impacts that these policy changes have had on Cuba’s agricultural production, consumption and import patterns. Legislation authorizing the establishment of UBPCs from the former State farms in late 1993 marked the beginning of a significant process of transformation in the structure of agricultural production in Cuba. Nova González (1998) wrote: “the positive experience over more than 20 years with smaller Agricultural Production Cooperatives (Cooperativas de Producción Agropecuaria or CPAs) provided the foundation for the planning and creation of the UBPCs. Even during the early years of the Special Period, the CPAs had demonstrated their ability to better adapt to difficult economic conditions” (p. 1). The transition from State farms to UBPCs occurred rapidly following the passage of legislation authorizing their creation in September of 1993. 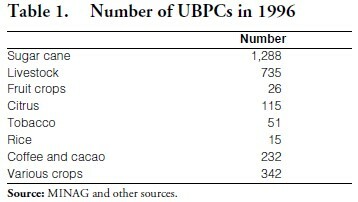 By the end of 1995, over 2,800 UBPCs had been created (Oficina Nacional de Estadísticas 1996; see also Table 1) encompassing about 42 percent of total agricultural land in Cuba, a proportion that remained steady in 1996 and 1997 (Table 2). 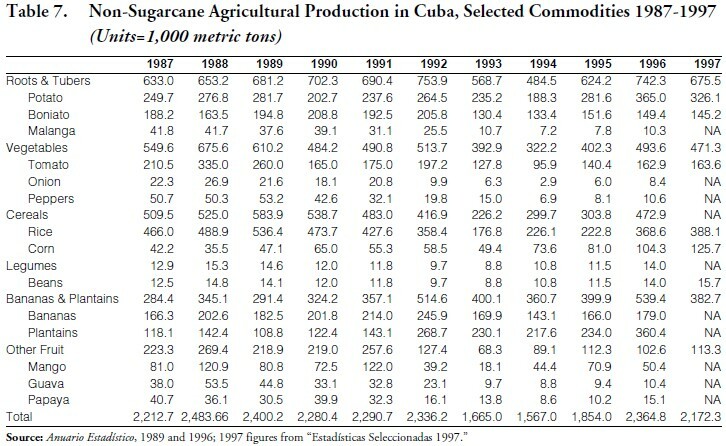 State farms, which held nearly three-quarters of total agricultural land area in Cuba in 1989, only represented about one-third of the land area by 1995 (Table 1). In the 1996 issue of the Anuario Estadístico de Cuba, there is a change in the statistical reporting for agricultural small holders that is worth noting. In the 1989 Anuario, there was a single reporting category for “dispersed private” farms. However, in the 1996 issue, there is a category for “dispersed private” farms and an additional category for “other private” farms. No explanation is provided for the distinguishing characteristics of “dispersed private” farms and “other private” farms.1 When the figures for the “dispersed private” farms and the “other private” farms in the 1996 Anuario are added together, they appear to represent the continuation of the single statistical series of “dispersed private” farms from the 1989 issue. Assuming this is the case, between 1989 and 1996, agricultural land area for all “private” holders (i.e., “dispersed” plus “other” holders) increased by nearly 17 percent, from 230,600 hectares to 269,200 hectares (Table 2). This expansion may reflect the influence of government programs to provide land in rural areas to small holders to produce chiefly coffee, cacao and tobacco. 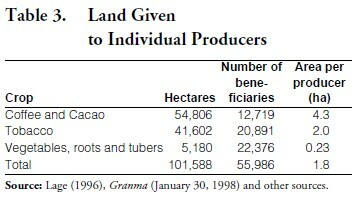 However, Nova González reported that, by 1998, over 100,000 hectares of land had been distributed to small holders, so the majority of the distributed lands are held in some form of production other than the “private” category (See Table 3). 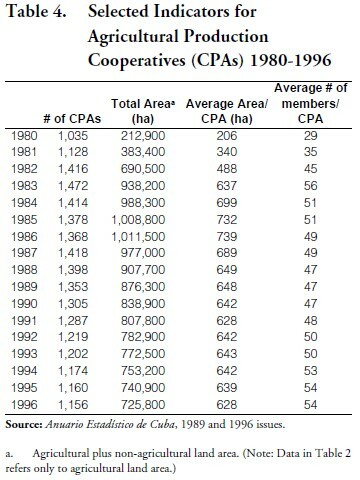 Between 1989 and 1996, agricultural land area for Cooperatives of Credit and Services (Cooperativas de Créditos y Servicios or CCSs) also increased by almost six percent from 739,100 hectares to 782,700 hectares (Table 2). While this increase is only about one third of the percentage increase in agricultural land area experienced by “private” farms, it represents a larger absolute increase in land area since CCSs represent a larger proportion of total agricultural land area than the “private” farms. Despite the expansion in agricultural land area for UBPCs, “private” farms and CCSs, between 1989 and 1996, agricultural land area for CPAs fell by nearly 20 percent from 769,800 hectares to 620,200 hectares (Table 2). This is actually a continuation of a pattern of steady declines in land area that had been experienced by the CPA sector in Cuba since the mid-1980s (Table 4). (Note: Table 4 shows this trend in terms of decreases in total land area for CPAs, which equals the “agricultural” area data series used in Table 2, plus “non-agricultural” land area that includes forests, swampy and otherwise unusable land, plus areas for buildings, etc. Time series data for changes in CPA “agricultural” land area is not available.) This trend stands in contrast to the aforementioned quote by Nova González regarding the “positive experience over more than 20 years” with the CPAs. In their 1993 work (based on the 1989 Anuario), Puerta and Alvarez documented how CPAs, CCSs and “dispersed private” farms utilized their land more intensively (that is, cultivated higher proportions of their agricultural land areas) than the State farms in the late 1980s. This trend continued through 1996, with the UBPCs showing higher rates than the State farms in the proportion of their agricultural land area under cultivation (Table 5). On average, State farms were only cultivating about 44 percent of their available agricultural land in 1996 compared to 57.9 percent for CCSs, 61.2 percent for CPAs, 64.5 percent for UBPCs, and 68.3 percent for “private” farms. Viewed another way, State farms had an average of 13.8 percent of their agricultural land area idle; this is more than twice the proportion of idled land area for UBPCs and “private” farms and more than three times higher than the proportion of idled agricultural land area for CPAs and CCSs. The creation of UBPCs brought about an important shift in average farm size in Cuba as UBPC farm sizes approached those of CPAs. The magnitude of the shift in scale is documented in Table 6. In the case of sugar cane, livestock and tobacco, average UBPC size was less than 10 percent of the previous State farm size. The average size for UBPCs for production of vegetables, roots and tubers was only slightly more than 10 percent of the previous State farm size, and rice UBPCs were less than 20 percent of the size of previous State rice farms. The contention in Cuba is that the decrease in scale of agricultural production that the UBPCs have brought about will be the basis for a more efficient and sustainable production systems under the conditions of limited availability of agricultural inputs. In examining shifts in the patterns of agricultural production, the next section of this paper will attempt to assess the degree to which this is the case. Table 7 contains an 11-year time series of Cuban production data for selected agricultural commodities used primarily for domestic consumption (as opposed to export crops). This data series provides a detailed examination of the extent of the deterioration that took place in Cuba’s non-sugar agricultural production following the loss of Soviet support and subsidization. For all of the commodities, production volumes fell to their lowest levels in either 1993 or 1994. Table 8 was prepared in an effort to summarize the extensive data contained in Table 7. For each commodity listed in Table 7, Table 8 shows the lowest production volume (achieved in either 1993 or 1994) as a percentage of the peak production level achieved during the period 1988 to 1990. By the 1993 and 1994 seasons, production of such staple crops as rice and vegetables were only 33 and 48 percent respectively of the peak production levels achieved between 1988 and 1990. Tables 7 and 8 also document the recovery in production which took place following the formation of the UBPCs and MAs, by showing the highest production volume achieved in either 1996 or 1997 as a percentage of the peak production level achieved between 1988 and 1990. While rice and bean production clearly showed some recovery, production of malanga, peppers, guava and papaya remained well below levels achieved in the late 1980s. Several exceptions to the general trends should be noted. For example, production of plantains was nearly twice as high in 1993/1994 as their peak level in 1988 and corn production also registered some increases during the early 1990s. These production trends presumably were the result of initiatives to expand production in an effort to offset the loss of food import capacity experienced after 1990. By 1996, root and tuber production had recovered and increased to levels higher than the peak achieved between 1988 and 1990. This trend, however, reflects substantial increases in potato production that occurred largely as the result of concessional sales and donations of seed potatoes from Canada and France. While potato production in 1996 was higher than the peak volume achieved in 1990, when production figures for potato are deducted from total root and tuber production, net production of other roots and tubers in 1996 was only about 75 percent of the peak volume achieved in 1990. One way of providing a very broad assessment of overall shifts in production of the staple crops in Table 7 is to total the production volumes for all crops by year. In examining these totals, we note that in 1994, total production had fallen to 63 percent of the peak production level in 1988. By 1996 total production volume had recovered to about 95 percent of the 1988 peak level, suggesting that, while the composition may have changed somewhat, food volumes moving through Acopio in that year should have approached those in 1988. While production volumes in 1997 fell below those of 1996, reports from Cuba indicate that this is, in part, the result of damage caused by Hurricane Lili in late 1996, which is not implausible. Just four years from the time of their formation (i.e., by 1997) the UBPCs reportedly produced more than 70 percent of Cuba’s sugar cane, 42 percent of the milk, 32 percent of staples, 12 percent of vegetables, 36 percent of citrus, 16 percent of tropical fruits, 38 percent of rice, 22 percent of coffee and 7 percent of tobacco (“Las soluciones,” 1997). This emphasizes the important role that the UBPCs play in Cuba’s agricultural sector. 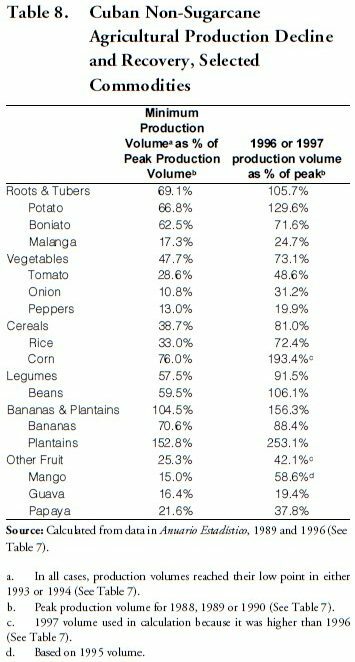 The tremendous importance of the MAs in Cuba is perhaps most clearly demonstrated by Nova González (1998) who has estimated that, in the City of Havana, ration markets only are able to supply about 60 percent of daily caloric consumption for the population (Table 10). “Social meals”6 provide another approximately 8 percent of caloric consumption. This means that the average citizen in the City of Havana must rely on the MAs and other sources for about one third of their caloric requirements. Such purchases represent a relatively high proportion of the total monthly income of the average Cuban household. 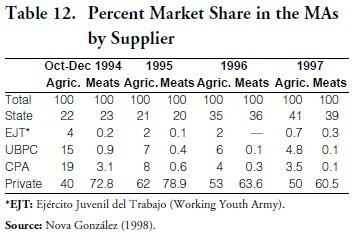 This serves to highlight what may be the quintessential enigma of Cuba’s agricultural economy: how is it that food supplies in the MAs, which are supposed to be “surplus” production (i.e., production in excess of quota obligations for sale to Acopio) remain high while food supplies in the ration stores are not sufficient to meet the needs of the population? The Cuban government offers no explanation for this condition. While the full explanation for the situation is undoubtedly complex, in the last section of the paper we will discuss the role that shifting food import patterns may play in this situation. In 1994, the author heard a Cuban scholar refer to the opening of the MAs as an attempt by the Cuban government to, among other things, “bleach” the black market. Empirical evidence suggests that the MAs have been somewhat successful in this regard.7 The MAs also served an important role in broadening the availability of food outside of the ration system within Cuba. Prior to the opening of the MAs, black market sales were conducted almost exclusively in dollars. As a result, individuals and families without access to hard currency were not able to obtain food or other products through the black market. Opening of the MAs enabled purchases of “surplus” food supplies for pesos, which was an important development. Nova González (1998) refers to the way in which “the re-opening8 of the free market for agricultural products (October 1994) deflated prices of products that had previously been sold in the underground economy or black market” (p. 8). This was accomplished by reducing the risk premium for sales conducted through the underground or black markets. Nova González also refers to a series of financial measures adopted by the government during the second half of 1994 that influenced prices of agricultural products in the MAs. Specifically, he cites how the increase in prices of some other services and goods and the imposition of a tax system reduced the amount of discretionary money held by citizens as well as the volume of money in circulation which in turn decreased the demand for sales in the MAs, thus helping to hold down prices. It is not possible to disaggregate the two factors (reduction in risk premiums and impact of these financial measures) to determine the extent to which each influenced the establishment of prices in the MAs. During the first three years following the establishment of the MAs, the sale of agricultural products and meats steadily increased. 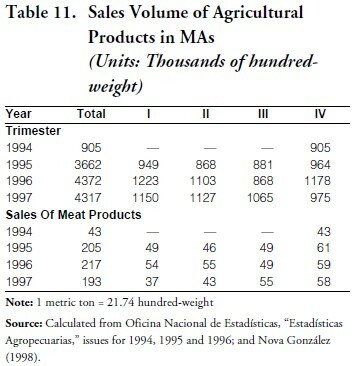 Between 1995 and 1996 there was an increase of 19 and five percent respectively in sales of agricultural and meat products in the MAs (Table 11). In 1997 the slight decreases in the sales of agricultural and meat products are once again attributed to the effects of hurricane Lili. Nova González provides some especially interesting statistics regarding the main suppliers to the MAs. The “private sector,” which in this case includes CCSs, “dispersed” farms and “other private” farms, has been especially active and important in the MAs since their “re-opening” in October 1994, holding between 40 and 62 percent market share for agricultural products and between 60 and 79 percent market share for meat products (Table 12). Interestingly, the State has been another important participant in the markets through Acopio, with their market share steadily increasing between 1995 and 1997 to approximately 40 percent market share for both agricultural and meat products. This is presumably part of an effort by the government to keep prices in the MAs low and food supplies outside of the ration stores relatively accessible to the populace since the ration stores are not able to supply all of the food needs. Meanwhile, there has been a steady reduction in the presence of UBPCs, CPAs and the EJT as participants in the MAs. These trends may be a bit misleading, however, as Nova González (1998) reports that it is likely that some of the increase in the activity of the State (Acopio) in the MAs represents purchases from UBPCs, CPAs and/or the EJT that have decreased their direct participation in the MAs. However, even if the entire supply of products supplied to the MAs by Acopio was from stocks normally destined for the ration stores, this would only provide a partial answer to the question raised previously regarding the extensive supply of “surplus” production in the MAs when ration requirements are not able to be met. Prices of representative products sold in the MAs have generally tended to show little change over time (Table 13). Black bean, garlic and onion prices do change somewhat however. In the rest of the provinces, prices in the MAs are lower and they fluctuate less than in the City of Havana (Table 14). Shifting import patterns also must be examined to have a full perspective of the changes in Cuba’s agricultural and food situation. Table 15 contains data on the value of Cuban food imports and total imports from 1989 through 1996. The value of Cuba’s food imports fell by nearly 50 percent between 1989 and 1994. However, over the same period, the value of Cuba’s total imports fell by more than 75 percent. As a result, food imports doubled their share of total import value from 11 to 23 percent. This clearly demonstrates that the government of Cuba placed some priority on maintaining food import volumes to the extent possible during the crisis of the Special Period. It also highlights the importance to the Cuban government of maintaining food import volumes to meet domestic food requirements. With its chronic trade deficits and continuing economic difficulties, there is some question regarding whether or not Cuba will be able to sustain the level of food imports seen in recent years. This is an especially important and pressing issue for the Cuban government. The Cuban government has done little to remove the obstacles that hinder the efficient functioning of the agricultural sector in Cuba since the establishment of UBPCs in 1993 and the opening of MAs in 1994. Nevertheless, both of these institutions play important roles in Cuba’s agricultural economy at the present time. Increases in the production of staple food crops experienced in Cuba after 1994 are not entirely attributable to the formation of UBPCs. Even the Cuban government reports unprofitability of a large proportion of the UBPCs. And, while not a topic addressed in this paper, it is widely recognized that the results for UBPCs in the sugar industry have been disappointing. The fact remains that the large scale, highly mechanized, input-intensive State farms were no longer viable following the loss of Soviet support. In light of that situation, the UBPCs appear to have achieved some level of success in terms of providing food for the Cuban people, despite the fact that many structural rigidities remain in place in Cuba which have prevented the agricultural sector from responding as efficiently as it could have. However, staple food production patterns in Cuba over the last few years and the lack of further internal adjustments indicate that there is little reason to expect any significant expansion in production in the near term. With the MAs providing about one-third of the caloric requirements of the Cuban people, these markets have played and are expected to continue to play an important role in feeding the population even though food costs in the MAs remain expensive relative to general income levels. Thus, opening of the MAs would appear to be another successful, and perhaps even pivotally important policy change implemented by the Cuban government. 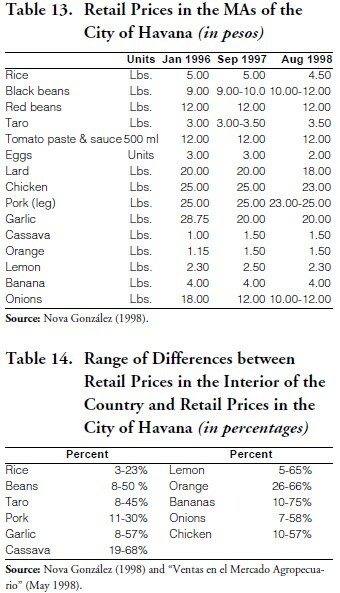 An examination of Cuban food import patterns suggests that decreasing food import volumes offer a partial explanation of the shortfalls being experienced in the food rationing system in Cuba at a time when “surplus” food supplies (supplies in excess of quota requirements for sale to Acopio) in the MAs appear relatively plentiful. However, because of its chronic trade deficits and continuing economic problems, questions remain regarding Cuba’s ability to continue its present level of food imports. The evidence presented in this paper suggests that the establishment of UBPCs and the opening of MAs have had positive impacts on food production and availability in Cuba from the critically deficient levels experienced in 1993-94. However, their influence has not been sufficient to offset all of the problems experienced as a result of the loss of Soviet aid. While the food and agricultural situation in Cuba at the present time does not appear to be as difficult as it was in 1993 and 1994, the aforementioned factors suggest that the present equilibrium (such as it is) may indeed be fragile. 1. This author speculates that the “dispersed private” farms may be those farms with quota obligations for sale to Acopio while perhaps the “other private” farm category represents holders who are so small that the government does not establish quota obligations for them. 2. Anuario Estadístico, 1989 and 1996 issues. 3. Anuario Estadístico, 1989 and 1996 issues. 4. 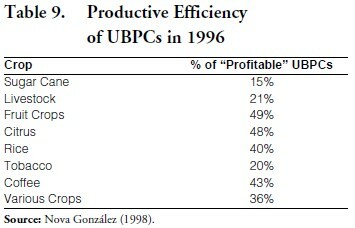 In his 1998 publication, Nova González provides an interesting discussion of some of the barriers to improved efficiency of the UBPCs. 5. This section draws heavily from Nova González (1998). 6. Meals provided for workers and students, or sales to workers. 7. Anecdotal evidence from Cuba indicates that black market food sales continue to take place. It is likely that food volumes moving through the black market now are smaller than the volumes in 1993 and early 1994. However, there is no information or basis whatsoever upon which to base even the roughest of estimates of black market food sales. 8. An implicit reference to the previous experience with free agricultural markets in the early 1980s.